Auricular Medicine is a complex system which uses electromagnetic signals of the body to give health information, and can be helpful in predicting the effectiveness of various treatments, including Acupuncture, Homeopathy, Supplementation plan, Nutritional requirements, as well as assessing blockages, deficiencies, sensitivities, allergies, and more. Auricular medicine was developed by Dr. Paul Nogier, who was a physicist, neurologist and acupuncturist. It evolved from his work in 1958 when Dr. Paul Nogier introduced a new system of acupuncture known as Auricular Therapy. 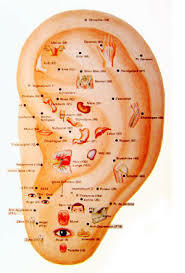 Auricular Therapy is a comprehensive treatment approach for the entire body performed exclusively on the outer ear. Nogier discovered that our brains constantly project energy patterns from the ear that correspond with every organ of the body. His research revealed that illness or injury causes a change in electrical conductivity of the skin, expressed as an ear acupuncture point that would otherwise not be present. In 1966, Dr. Nogier began taking his patients' pulse while examining their ears. He noticed a stronger or fuller pulse could be felt for a few seconds when he touched certain areas of the ear. He determined that this reflex of the cardiovascular and nervous systems happens all the time upon stress, and that it could be reproduced for examination purposes. Nogier discovered that in the absence of disease, our ears project a normal electromagnetic field that extends outwards less than half an inch. But when imbalances or blockages exist on the physical, emotional or spiritual body, this field expands up to several feet away from the ear. Nogier used Kodak-Wratten color filter of specific light frequencies to determine the electromagnetic field distance. By gliding the filter towards the ear, we can observe how far away it is from the ear when the pulse reflex gets triggered. Auricular Medicine enables one to determine how far off the body this electromagnetic field projects under various conditions. Measurements of the electric fields (through bio resonance) using Auricular Medical techniques enables us to detect blockages, or stressed areas of the body, as well as test samples of various substances (ie. supplements & different foods) and immediately observe its energetic effect on the patient's body. This technique can be helpful not only in assessing the effect of different substances on the body, but also checking for blockages and diseased areas of the body, and customizing protocols that optimize the body's self-healing and auto-regulating mechanisms.